This amazing Peruvian pasta dish has been the most misunderstood item on the Smith & Daughters menu. The staff still beg us to bring it back. 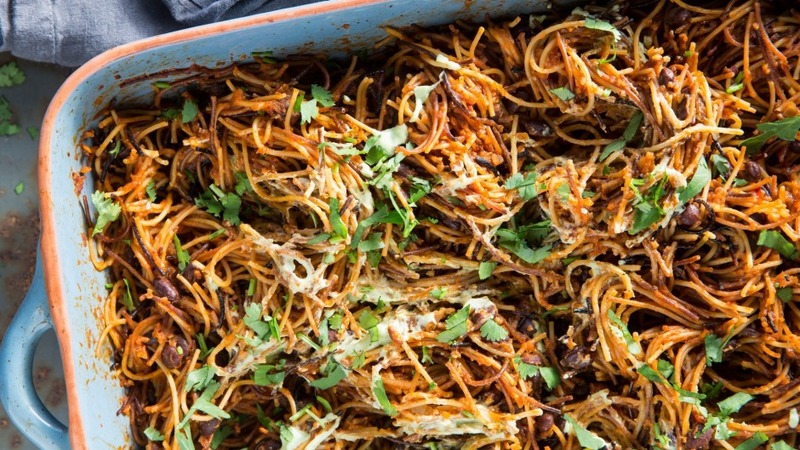 If you don't think of it as spaghetti bolognese, or anything Italian and pasta-y that you're used to, you're in for a real treat. It's totally delicious, spicy and unusual. Make it! See for yourself! Preheat the oven to 170°C. Lightly grease a 30cm x 20cm ovenproof dish with olive oil. Heat the extra-virgin olive oil in a large saucepan over medium heat. Add the pasta and fry for 2–3 minutes until golden brown. Drain on paper towel. Place the onion, garlic, chipotles, tomatoes, ground coriander and oregano in a blender and process until smooth. Transfer the sauce to a pan with the bay leaves and cook over medium heat for approximately 10 minutes, or until thickened. Stir in the stock, fried pasta and beans, and season with salt and pepper, to taste. Bring to the boil, then reduce the heat and simmer gently, uncovered, breaking up the pasta with a spoon, for about 5 minutes. Remove the bay leaves, then transfer the mixture to the prepared ovenproof dish and cover loosely with foil. Bake for about 20 minutes, until most of the liquid has been absorbed. Serve, drizzled with coriander cashew cream and coriander leaves scattered over the top. Simply put, this is a Chilean shepherd's pie and it's how we describe it on the menu. Typically, this dish has big juicy chunks of beef, but we find eggplant (aubergine) is the best substitute as it doesn't have much flavour of its own, and carries all the flavours of the dish while still retaining its shape. This is fantastic served with a green salad dressed with our Lemon and Cumin Vinaigrette. Tofu – we've had bad tofu experiences too, we get it. This is not one of them. It is purely a textural inclusion as we're replicating boiled eggs that are also typically in this dish. Olives – if you don't like them, don't include them, but you're a dummy if you don't. What are you, five years old? Grow up. Coat the bottom of a large ovenproof frying pan with a thin layer of olive oil and place over medium heat. Add the eggplant and cook for 3–4 minutes until soft and slightly golden. Transfer the eggplant to a bowl and add another swig of oil to the pan. Add the mushrooms, season with salt and pepper and cook for 3–4 minutes until golden. Add the mushroom to the bowl with the eggplant. Add another swig of oil to the pan and cook the onion, garlic, jalapeño and capsicum with a large pinch of salt. Cook for 3–4 minutes until soft, then add the tomato paste, cumin seeds and oregano, and cook for a further 1 minute over low heat. 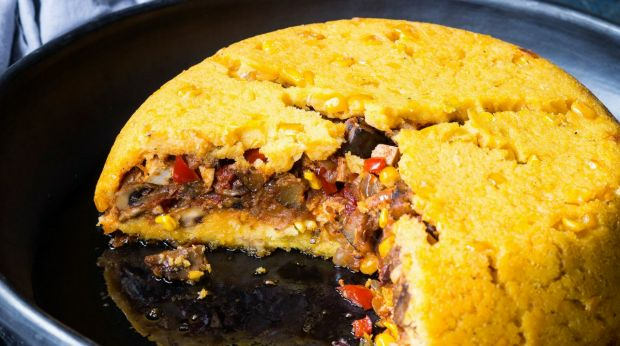 Return the eggplant and mushroom to the pan and add the tomato, red wine vinegar, tofu, olives, paprika, soy sauce and 60 ml (2 fl oz/1/4 cup) water. Season with salt and pepper and cook over low heat for 15 minutes to allow the flavours to develop. Remove from the heat and throw it all back into the bowl. Rinse out the pan because you're going to be building the dish in there. Heat the soy milk and butter in a medium-sized saucepan until it comes to a slow simmer. Add the creamed corn, nutritional yeast (if using) and frozen corn, and stir to combine. Pour in the polenta in a steady stream and whisk until it's all incorporated. The mixture will become very thick so you'll need to swap your whisk for a wooden spoon. Reduce the heat to as low as possible and cook, stirring constantly, for about 5 minutes. Season with salt and pepper, to taste. If you have a cheeky bit of cheese lying around, chuck it in at this stage and stir until melted through. Preheat the oven to 170°C (340°C). Rub the base and side of the frying pan you've been using with a little olive oil. Scoop about one-third of the corn mixture into the bottom of the pan and spread out to cover the entire base of the pan. It will be a bit sticky so it's going to be easier if you wet your hands first and then press it down using flat fingers. You can use a wet spoon, but where's the fun in that?! Pour over the filling and spread out so that the base is completely covered and the top is flat. Now, finish off with the the rest of the corn mix and spread out evenly so there is no filling to be seen. Bake in the oven for 30–40 minutes, until the top is starting to turn golden and crunchy-looking. Don't let it get too dark though or it will dry out. Remove from the oven and (if you can help yourself) set aside for about 5 minutes, to allow the crust to firm up a little. Sprinkle over some sea salt flakes before serving. At the restaurant, we serve these as individual portions in small casserole dishes, but for you, scoop out a generous portion, making sure to get the base, filling and top. 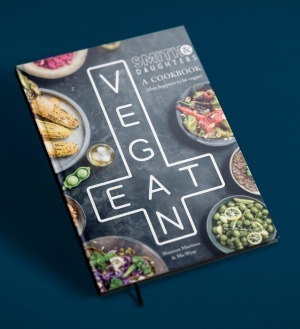 This is an edited extract from Smith & Daughters: A Cookbook (that happens to be vegan) by Shannon Martinez & Mo Wyse published by Hardie Grant Books, $48.00 and is available in stores nationally.